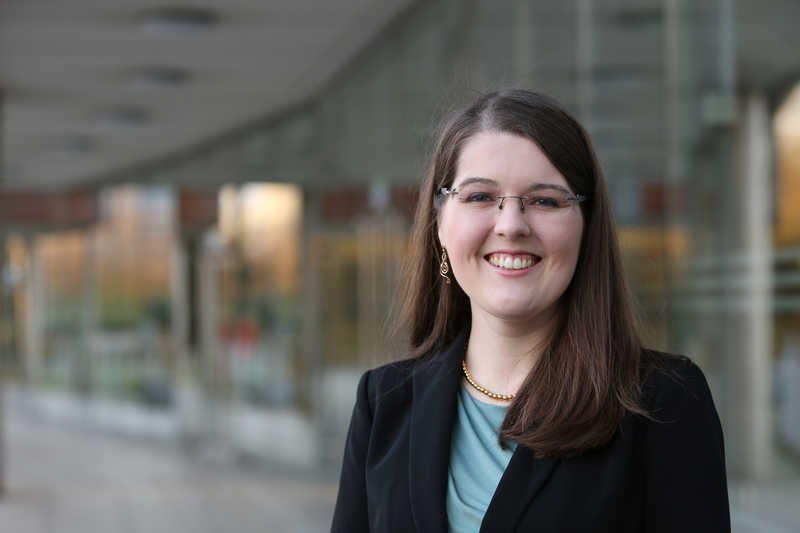 I’m Dr Elizabeth Argyle, Research Fellow in the Institute for Aerospace Technology University of Nottingham. 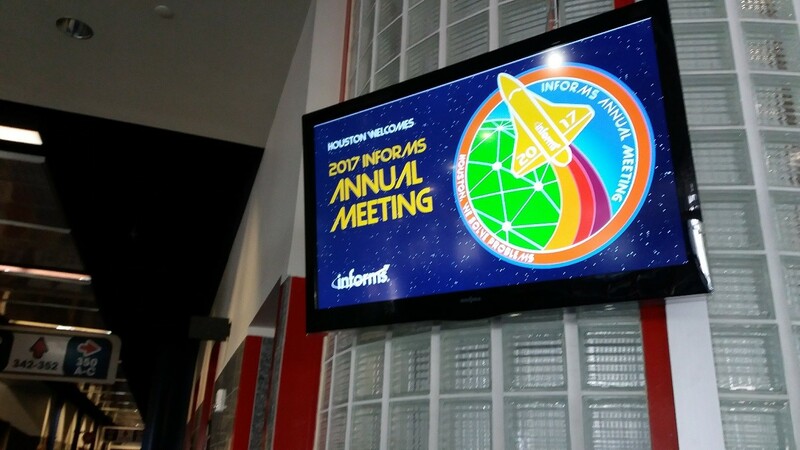 Last October I had the opportunity to take my groups work on the road and travel to Houston, Texas in the United States to speak at the 2017 Annual Meeting of the Institute for Operations Research and Management Sciences (INFORMS). The conference drew over 5,800 practitioners and researchers in operations research, analytics, and management science from around the world. I had the pleasure of giving a talk titled, “Decision Support for Airport Surface Operations: A Sociotechnical Systems Approach” during which I summarized our group’s on-going collaboration and its focus on the human-centered development of decision support tools for tower controllers. When the call for papers was released in Spring 2017, I knew the meeting would be a great opportunity to share our work with other experts in the field of operations research. I worked with my collaborators (from the Human Factors Research Group, Automated Scheduling Optimisation and Planning (ASAP) Research Group and the NGI – Nottingham Geospatial Institute) to put together a short abstract covering what we wanted to share in the talk. Once the abstract was submitted, we waited with anticipation for a decision, and we were very pleased when we found out several months later that it had been accepted as an oral presentation in the Behavioral Operations track. We got down to business and began organizing the presentation, including deciding which aspects of our research we wanted to highlight. After much deliberation, we decided to highlight two solutions that members of our group had developed for managing aircraft scheduling and their impact on airport operations, then finishing by discussing our sociotechnical systems approach for informing systems design. After weeks of discussions, presentation making, and practice, October rolled around and I found myself jetting across the Atlantic ready for the big day. My talk was on the second day of the conference, so I was able to get into the spirit of the event on the first day by attending a keynote lecture, networking with other attendees, and seeing a number of interesting talks on topics ranging from aviation to queuing theory to predicting human behavior and characteristics from big data. My talk was scheduled first thing in the morning on the second day of the conference. I was ready, bright and early, to tell the world about our sociotechnical systems approach for solving problems related to airport operations management. I told attendees about a tower control solution that my group had developed: an algorithm to support tower controller decision making related to determining the best time for flights to start their engines and also push back from their gates. After summarizing successes to date, I was excited to discuss a topic close to my heart—human factors research. I described an experiment that investigated strategies that human problem solvers used to complete a task that simulated sequencing flights for take-off from an airport’s runway. In addition to strategic thinking patterns, we also looked at how the complexity of the holding area network and the problem solving objective affected task performance. I’ll save going into detail about the results for another blog post, but we found that participants were more likely to identify the optimal solution to each aircraft sequencing problem when they spent longer considering the problem and when the problem space was reduced, e.g. when the participants received requests for aircraft to take off in a particular order. The conference was held in the George R. Brown Convention Center in Downtown Houston. 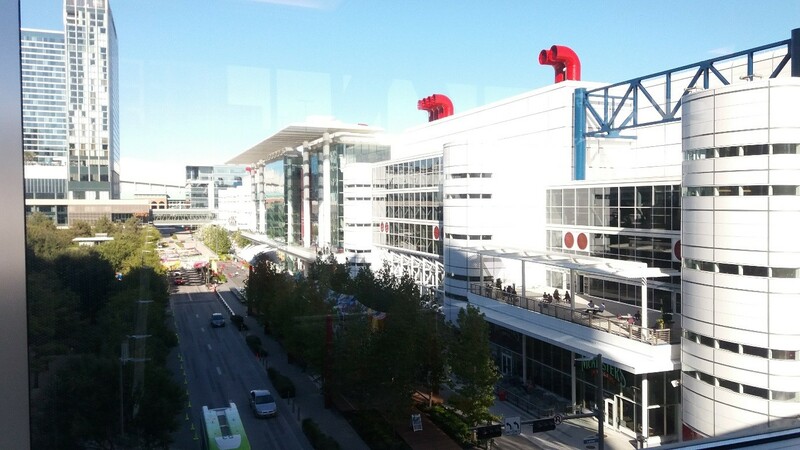 George R. Brown Convention Center in Downtown Houston. Once the excitement of giving the presentation was over, I was free to enjoy the rest of the conference, which involved many interesting talks, numerous opportunities to network with other researchers and industry practitioners during the coffee breaks, and an especially thought-provoking plenary talk about how Uber uses data analytics to manage their ride-sharing marketplace. Overall, my first INFORMS conference was a great experience, and I would encourage anyone interested in operations research, data analytics, and management science to attend in the future.